Mike Antonucci’s Union Report appears most Wednesdays; see the full archive. Perhaps I’m naive, but I view the conflict over education policy as part of the normal ebb and flow of American politics. Victories are won and losses sustained by both sides, but no advantage is ever permanent. It is a contest of differing philosophies, the outcome of which changes with the mood of the citizenry. There are those, however, who view this contest as an apocalyptic fight against the forces of evil, whose tentacles reach into every home and classroom. Their power is vast and shadowy, and they must be stopped lest the very foundations of our nation be toppled. The people who believe this stuff are, of course, nuts. 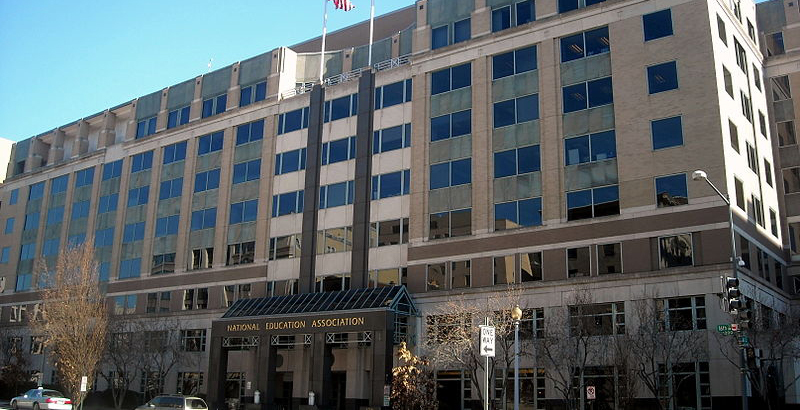 Unfortunately, some of them were given free rein to peddle their wares at the National Education Association Leadership Summit, held over the weekend of March 15 in Denver. The summit is designed to offer training and information to NEA’s current and up-and-coming local officers and representatives. There are workshops and seminars on all sorts of topics, from political advocacy to the fundamentals of union finances. This year’s summit also featured three presentations about NEA opponents. It is worth knowing how union activists characterize people with whom they disagree. The most comprehensive of these was titled Who Are the Adversaries of Public Education and How Do They Impact Us and Our Students? It was delivered by three retired members of the Illinois Education Association. They began by asking, “What are the goals of our adversaries?” It might be too much to expect them to answer this question in a fair and reasonable way, but they didn’t make much of an effort. “Eliminate public education in favor of privatization; use government to suppress voting rights; eliminate the collective voice of voting blocks [sic] of groups of citizens; destroy unions and oppose pro-worker candidates’ campaigns,” one slide reads, going on to list the adversaries’ opposition to child labor laws, food and drug safety, clean air and water, and public national parks. They then follow a line of free-market and libertarian thinkers to arrive, inevitably, at the Koch Brothers, Cato Institute, Reason Foundation, American Legislative Exchange Council and the State Policy Network. You can wade through the fever swamp yourself, but suffice it to say you will find all the usual suspects. That is a vast conspiracy indeed. Our third presentation, titled School Vouchers: Learn the History & Prepare for Future Battles, was hosted by a staffer from NEA headquarters and a retired union officer from Milwaukee. Apparently, teachers union retirees have created a cottage industry of agitated PowerPoint presentations. This slide show takes us back to segregation, then travels forward in time to include Chilean dictator Augusto Pinochet, the Bradley Foundation and Charles Murray. NEA’s conspiracy theories have a history of their own, going back to 1998 at least. In September of that year, the union released a report with the unwieldy title The Real Story Behind “Paycheck Protection” — The Hidden Link Between Anti-Worker and Anti-Public Education Initiatives: An Anatomy of the Far Right. Some of the names have changed, though some remain in the 20-plus years since this was published. Perhaps both sides can take comfort in the realization that 20 years from now, a new group of NEA Leadership Summit attendees will view some sort of robot/hologram presentation about the next set of union adversaries — probably the men and women who invented the robots and holograms.